With blessings of all "THE KOTHI HERITAGE" has received a " *_Certificate of Excellence Hall of Fame"_* Recognising 5 Consecutive years of Consistently High Ratings from Travellers every year for the past five years. This Kothi was constructed about 130 years back in 1888 by Bachraj Ji Singhvi He was Commander In Chief, Member of State Council and Member of Municipal Committee at that time. He also constructed the famous Building in Jodhpur named as Tripolia in a shortest period of one night. The Kothi Heritage property is now completely renovated with all modern, contemporary and luxurious facilities with perfect heritage touch. It is amazingly graceful from almost every angle. Blending past elegance with modern day amenities, The Kothi Heritage serves as one of the finest Heritage Guest House in Rajasthan. A stay here is guaranteed to be memorable experience of lifetime. The rugged exterior contradicts an inner paradise with a striking blend of art and architecture leaving you with a magnificent aura! The spellbound grandeur of the Haveli offers picturesque settings, lattice work friezes and intricate ventilators which at once transports you back in time to experience the majesty of a long-gone era of valour and chivalry. The Kothi Heritage consists of Central Hall with height of 30 ft of its own, and as many as 48 all different hand made Trellis (Jalies) gives the exclusivity of old workmanship. Run by a family of Singhviâ€™s, Hotels Jodhpur- The Kothi Heritage is one of the finest hotels in Jodhpur. Built in traditional style, there are beautifully carved balconies, attractive courtyards, open terraces, lovely garden and comfortable rooms with antique furnishings. 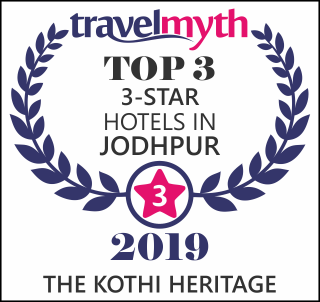 The Kothi Heritage, Hotels in Jodhpur is located in a plush residential area of Jodhpur, well insulated from the bustle and chaos of the city in Rajasthan, a North-western province of India. Jodhpur also called the Blue City, surrounded by the ancient Masuria Mountains. Ranked as one of the best run budget hotels in Jodhpur, Accommodation Jodhpur, Accommodation Hotel India Jodhpur, Hotels with 3 star facilties in Jodhpur, offers guests a pleasant and comfortable traditional Rajasthani hospitality. The Hotel is centrally located & is near the city's bus stand and the railway station. We are situated at Rajasthan in India in the sun city of Jodhpur , a city known for many historical places like the Mehrangarh Fort , the Umaid Bhawan Palace, the Jaswant Thada ,the Clock Tower and other haveli's with very rich heritage and architecture We offer special hotel packages to suite everyone's requirements. These special Luxurious Jodhpur Hotel packages, Hotels packages Rajasthan, Hotels Accommodation Rajasthan, Hotels in Jodhpur, Heritage Hotels in Jodhpur are provided at a discount on the normal room tariff and are valid from and to the dates mentioned. The Kothi Heritage a Heritage Guest House is Jodhpur is one of the budget hotels in Jodhpur and economy hotels Jodhpur Rajasthan providing bed and breakfast and the best Jodhpur hotels that are available in the category of cheap hotels in Jodhpur. The Kothi Heritage welcomes you to experience a truly delightful and wonderful stay in Jodhpur. Nestled in the lap of the city, The Kothi Heritage Jodhpur provides exquisitely furnished rooms befitting every comfort and luxury. The hotel also extends value added services and facilities to the esteemed corporate clients, businessmen with a homely touch and cheerful hospitality. The Kothi Heritage, one of the premium business hotels in Jodhpur is located in the heart of the Jodhpur City. Located close to most of the companies in Jodhpur and is very close to the Jodhpur railway station and close to Jodhpur airport and close to Jodhpur bus stand. This hotel is also easily accessible to the attractions of Jodhpur. Jodhpur, located at the heart of Rajasthan Tourism, caters to the business and leisure traveller. The Kothi Heritage located close to the Jaisalmer highway, Jaipur highway and Udaipur highway is a delight to stay at. Jodhpur, one of the exciting Indian Tourist Places, is inviting to the business as well tourist visiting Jodhpur. Here, The Kothi Heritage offers a serene refuge of comfort and hospitality where Indian tradition and modern services are blended. The Kothi Heritage - one of the most classic Jodhpur Hotels welcomes you to the world of traditional Rajasthani hospitality in this Sun City Jodhpur. Forget your worries in this beautiful and comfortable castle whose warm hospitality and splendour will linger in your minds forever. The Kothi Heritage is built as heritage style Jodhpur hotel with some of the most exclusive interiors and ambience in Jodhpur city. The Kothi Heritage Jodhpur castle has exclusive and artistically furnished rooms, modern amenities and a cuisine to suit every taste bud. Among the India Hotels and Jodhpur hotels The Kothi Heritage is recognised for its unique product. We are situated at Rajasthan in India in the blue city of Jodhpur, a city known for many historical places like the Umaid Bhawan Palace , the Mehrangarh Fort , the Clock Tower , the Jaswant Thada and other haveli's with very rich heritage and architecture. If you are looking for a real luxurious experience with a true Indian flavor, then we are the right place for you, as we are the luxury heritage hotel .The Kothi Heritage hotel is one of the finest hotels, a boutique homestay hotel with only suites and beautiful multi-cuisine restaurants that has crystal chandelier. This is what makes the The Kothi Heritage the best luxury hotel and a site seeing destination of Jodhpur, Rajasthan. The Kothi Heritage offers world class facilities and services, in order to make your holidays even more adventurous and luxurious by offering facilities of a Ayurvedic Massages, Kerala Massages, Beauty and Herbal Treatments to rejuvenate your mind, body and soul. We also run Camel and Village Safaris from the hotel to see the historical sites of Jodhpur. If you have some holiday plans like the ones that include site seeing different places at Jodhpur, kindly contact us to organize your tour of the whole of Jodhpur, with our special packages, and the best rates for Luxury Hotels in Jodhpur. We have the option of selecting accommodation starting from executive rooms to the luxury suite. A guest from Cape Town recently described the The Kothi Heritage as a "Home away from home" the moment you enter the doors you feel as if you are at your own home. Heritage Hotels in Jodhpur, Luxury Hotels in Jodhpur Heritage Guest House in Jodhpur City, Hotels Jodhpur Economy Hotels in Jodhpur, Budget Hotels in Jodhpur, Jodhpur Hotels Accommodation, Rooftop Restaurant in Jodhpur, Jodhpur Hotels near Passport Office Hotels Near Jodhpur National University, Tariff Hotels in Jodhpur, Hotels in Rajasthan , Heritage walk jodhpur INDIA.